Our house ‘Seestern’ is located in the hamlet of Vaschvitz in the small village of Trent, in the north-west of the beautiful island of Rügen. Surrounded by landscape and nature reserves directly on the Rassow Channel, the entrance of the Baltic Sea into the Rügen Bodden – landscape invites our house to stay and relax. 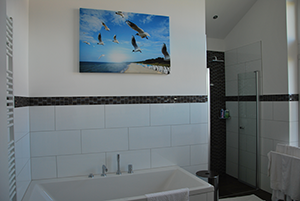 House Seestern is part of the holiday resort ‘Seeparkresidenz Rügen’ and is one of the few properties which are directly bordering the seafront zone and have direct unobstructed access and sea views from the deck. From the living room and terrace you have a beautiful view of the coastal strip, the peninsula Bug and the water surfaces of Bodden and Baltic Sea. In the garden you’ll find a “Strandkorb” at a sheltered place. The hotel’s small private hotel beach with beach chairs and sun loungers, the beach volleyball court and the children’s playground can be used free of charge by our guests. 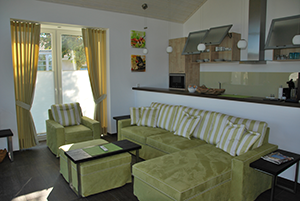 Our house offers everything for a perfect holiday: peace and nature, combined with exclusive comfort – all year round. Haus Seestern seems a world away from the hustle and bustle of Binz, Sellin or Göhren. But within 30-40 minutes you reach almost every place on the island. 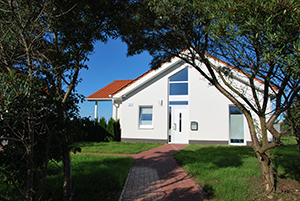 Haus Seestern is an ideal base for hiking, cycling, many kinds of water sports and not least for fishing or for trips to the island of Hiddensee.